This one had all the makings of a Hall of Fame reel. The comeback kid vs the dominator. The legend breaker vs the destroyer. The avenger (for teammate Coleman) vs the overlord. Thor vs Thanos. Which Randleman would we see: the Sakuraba/Lidell/Jackson Randleman or the Crocop/Rizzo/Rua Randleman? Fedor is always Fedor. As fate would have it, we ended up seeing a little of both Randlemans. 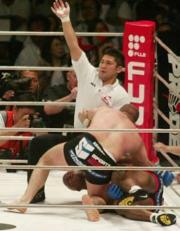 After the fight I would not have been surprised if Fedor suffered a deep cut and the officials found metal underneath. Randleman rushed Fedor and picked him in a takedown attempt, up eating a couple punches in the process. 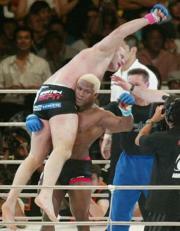 Fedor turned quickly, getting to his feet and Randleman helped him up, up , around, and down! 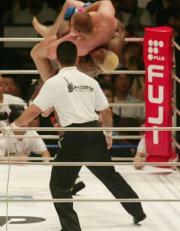 crashing onto his neck and left shoulder in one of the most amazing suplexes in MMA history. As amazing as it was, Fedor looked like he just woke up from a nap. What does it take to hurt this guy? Apparently, Fedor was out for a couple seconds, but as Randleman went to North/South position to throw his "skyscraper" knees, which well could have ended the fight. 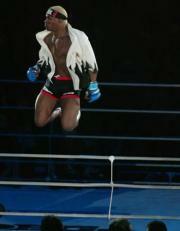 Fedor had recovered, stopped the knee, and reversed Randleman. Even then Randleman didn't want to let go of his arms locked around Fedor's waist even though it allowed Fedor to get into position, throw punches until he let go, get his arm, and easily lock him into a submission within 1:30. Randleman's incredible strength and speed will always keep him in the game, but his lack of a ground game is becoming progressively more apparent. We'll definitely see more of him in Pride though. media has nicknamed him "Donkey Kong". Rather unPC if you ask me.